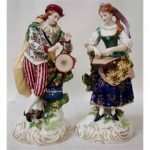 Royal Crown Derby porcelain china paperweights plates English bone china old imari patterns posies dinnerware birds tea set animals blue mikado. 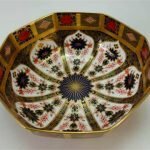 Royal Crown Derby octagonal bowl in 1128 Imari design, diameter 21cm & boxed. 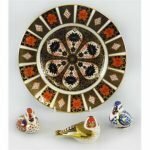 A Royal Crown Derby plate, pattern no.1128, 27cm diameter and three Royal Crown Derby paperweights as birds, all with gold coloured stoppers. 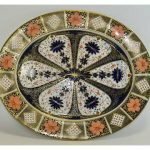 Royal Crown Derby Old Imari Pattern Quality Very Large and Impressive Platter. Pattern 1128. c.1970’s. 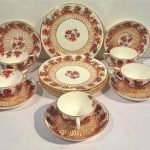 Royal Crown Derby Fine Quality Imari Pattern Set of Cups and Saucers ( 12 ) Pieces In Total. 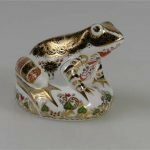 Date 1909, Imari Kings Pattern, Pattern No 383. Comprises 6 Large Cups and Six Saucers. 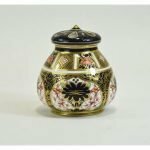 Royal Crown Derby Old Imari Pattern Lidded Pot Pouri. Pattern 1028, Date 1917. 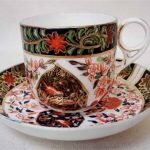 A 19th century Royal Crown Derby Tea Cup and Saucer, decorated in the Imari pattern number 198, blue printed mark. 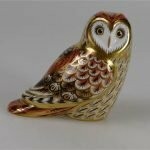 Royal Crown Derby paperweight of Short Eared Owl, for Collectors Guild, with gold stopper. 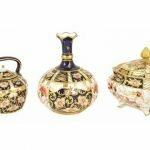 A Royal Crown Derby Imari pattern kettle, factory marks to base, pattern number 6299, together with a Royal Crown Derby Imari pattern bud vase, factory marks to base, pattern number 6299 1336 and another Royal Crown Derby trinket box and cover, Imari pattern. 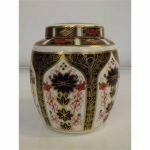 Royal Crown Derby ‘Old Imari’ 1128 pattern lidded ginger jar. 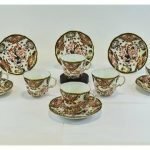 Crown Derby W.Litherland, Liverpool, Pattern 2047, Tea Set.